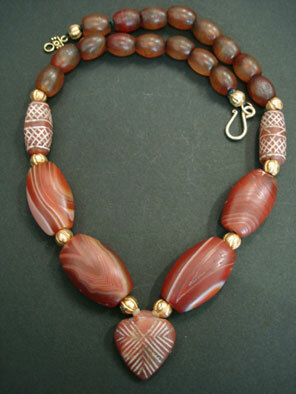 A stunning collectors item necklace full of carnelian and agate treasures. Four large antique banded Agate beads measuring on average 35mm x 20mm have gorgeous colouring and markings that almost want you to go and eat them! Two old etched carnelian cylinder beads and a focal heart shaped etched carnelian bead are from Central Asia. The etching is the result of staining and decorating the carnelian with a potash mixture and then firing the bead. 16 old carnelian beads from Yemen finish the necklace. These oval carnelian beads have fabulous patina with small circular markings. Overall a lot of the beads have small knocks and nicks which in my opinion add to the beauty of the piece and is testament to the journey these beads have travelled. Ten vintage gold lac over wax beads from Thailand and gold vermeil toggle complete the necklace. The necklace has been threaded on very strong waxed cotton.